Boulevard of the Environment, Gabes. Credit: Eric Goldstein.His monumental portraits may be gone, but ousted president, Zine el-Abidine Ben Ali, lives on in other ways in Tunisia’s public spaces. One legacy is naming a major thoroughfare the “Boulevard of the Environment” in nearly every city in the country. Ben Ali’s eco-friendly gestures were no doubt aimed in part to please the European Union, a major source of funding for projects to clean up the Mediterranean and reduce emissions and waste. 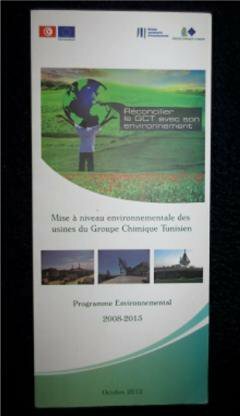 Tunisia signed a raft of international conventions on the environment, enacted numerous domestic regulations based on European standards for emissions, and published glossy publications vaunting its ecological commitments. In 1988, the year after Ben Ali seized power, the National Agency for Protection of the Environment came into being as the Environment Ministry’s enforcement branch. I’m green, Ben Ali seemed to be telling a western audience at a time when other Arab governments gave little or no importance to environmental issues. It was mostly for show: Tunisia’s heavy industries belonged to the state and were powerful revenue-producers that polluted with near-impunity. Meanwhile, the Ben Ali regime repressed virtually any activist or independent organization seeking to question government policies or to expose social ills. 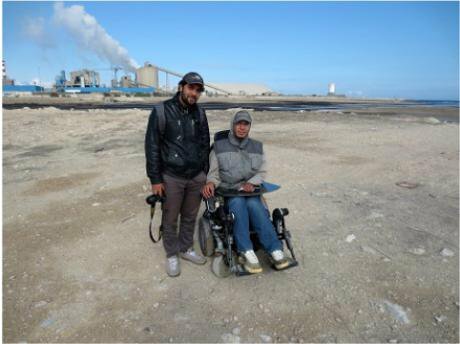 One such activist, Zoheir Makhlouf, went to prison in 2009 for putting on Facebook a video he made documenting industrial waste near the city of Nabeul. 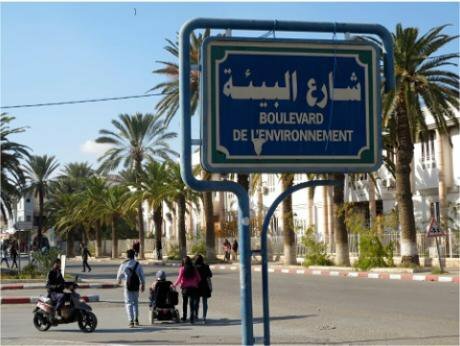 The way the public-sector corporation Groupe Chimique Tunisien (GCT) in the southern city of Gabes violated the law, openly and without penalty, reveals much about environmental policy under Ben Ali. Each year, the company dumped into the Mediterranean millions of tons of phosphogypsum (PG), an acidic byproduct of turning phosphate rock ore into phosphoric acid and fertilizer. The discharge violated the 1975 Water Law, which forbids the dumping into the sea of “any substances, especially household and industrial waste that might harm public health or marine flora or fauna, or set back economic or touristic development of the coastal regions.” It also apparently violated the 1996 Law on the Management and Disposal of Waste. While dumping continues, the political environment is changing. The GCT faces mounting social pressures over both jobs and pollution. It has made various environmental commitments and stepped up its public communication efforts. It has also declared it will switch to depositing the PG at an inland site, only to be stymied by public resistance by the population living near the designated site. 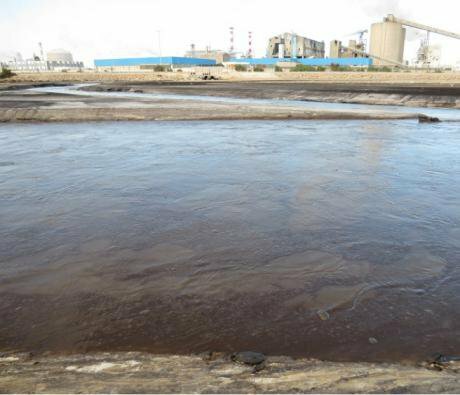 The story of GCT’s fertilizer factory in Gabes shows the challenges newly democratic governments encounter as they face a newly empowered public that is demanding both job creation and an end to the fouling of their local environment. Tunisia is hardly the first country in transition to reckon with the legacy of economically critical heavy state industry. The countries of eastern Europe also pursued policies that favoured such enterprises, ignored their environmental costs, and stifled protest. Following communism’s collapse, they had to contend with public outrage over pollution and its health effects, as well as demands for job protection and creation. As Tunisians navigate these issues, they face numerous challenges, including a dearth of the kind of pollution and public health data that would help them to choose the best policies, and a restive pool of unemployed people whose protests have cut production and state revenues. The practical meaning of these lofty phrases will be played out in Gabes, where pollution is the issue that crystallizes the public’s sentiment of marginalization. Since the 1970s, the country’s largest complex of chemical factories has sat at the northern end of the Gabes coastline, its chimneys emitting smoke and gases day and night, and its drainage pipes spewing phosphogypsum – a word that all the locals seem to know – into the Gulf of Gabes, forming a muddy, brown dead zone. Most of these factories belong to the GCT; a few smaller ones belong to other companies. Discharge near the GCT Plant flowing into the Gulf of Gabes. Credit: Eric Goldstein.Before Ben Ali’s ouster, GCT transformed 3.5 million tons of phosphate annually into fertilizer, making it Tunisia’s third-largest company, with annual revenues of 2 billion dinars (US$1.2 billion). But after a revolution that repudiated authoritarianism and neglect of the hinterlands, the GCT has faced public demands not only to address pollution but also to create thousands of jobs, demands sometimes supported by sit-ins that interrupted production. Its environmental commitments and job-creation programmes, along with disruptive protests, have cut into the GCT bottom line. Production is down 40 percent since the revolution, mainly due to disruptive protests to demand jobs, Noureddine Trabelsi, who heads GCT’s environmental unit in Gabes, told me in December 2013. Production has dropped even more steeply at the Compaignie de Phosphates de Gafsa (CPG), the companion state enterprise that mines the raw materials used in fertilizer production, due mainly to social protest actions but also due to limits in transport capacity. CPG recently reported that its 2013 output, though better than 2012, was only 40 percent of its pre-revolution level. Since the revolution, residents of Gabes, like those of inland cities, have hit the streets time and again to demand redress for what they see as Ben Ali policies that ignored the region while favouring development in the capital and the Sahel coastal plain. Heavy state industry brought Gabes thousands of jobs, but the resulting pollution undermined tourism, fishing, and agriculture. The Gabes plant is the only one of the four fertilizer plants that the GCT operates nationwide that dumps its waste into the sea rather than in designated land sites. A state interested in protecting the population alongside profitable public-sector enterprises would have subjected the Gabes industrial zone to extensive and transparent emissions monitoring and controls. It would have commissioned, and then acted on, epidemiological studies of the impact of the emissions on the health of workers and the local population. That didn’t happen under Ben Ali. It may turn out that the GCT fertilizer plants that dominate the city’s industrial zone are less harmful than the local population has come to believe. While local studies are needed to establish the situation in Gabes, research conducted on phosphate fertilizer plants elsewhere in the world suggest that, with proper controls, this is not among the most toxic of industries. The plants process minerals, not, say, carcinogenic solvents. And the gases they emit, such as nitrous oxides (NOx), sulphur dioxide (SO2), and gaseous ammonium (NH3), irritate the respiratory system in high concentrations but are not considered carcinogenic. Nader Shkiwa, 27, lives within walking distance of the gates of the GCT complex, in the oasis of Shott Sidi Abdeslam, a verdant neighbourhood in the mostly dry and dusty city. Confronting a state industry was dangerous if not impossible when Ben Ali ruled the country, Shkiwa told me. But within one year of the revolution, he co-founded the Association for the Protection of the Oasis of Shott Sidi Abdeslam, a neighbourhood group dedicated to compelling GCT to cut emissions and decontaminate the nearby coastline. The association operates out of a one-room storefront from which the smokestacks are visible. Under Ben Ali, Gabesians felt powerless about the CGT complex in their midst. There was an information black-out about its impact on its surroundings. Little surprise that they now blame it for chronic respiratory ailments, poisoning the Gulf, lowering crop yields, and consuming so much fresh water that it threatens the survival of the city’s coastal oases, a type of fragile eco-system that is found almost nowhere else in the world. “The fish are more intelligent than us: they left,” joked Mabrouk Jabri, an environmentalist who lives in Chenini, one of the oases in Gabes. A park wall in downtown Gabes. Credit: Eric Goldstein. Tunisia’s new constitution, in addition to promising to protect the environment, calls for “positive discrimination” to help the country’s marginalized regions, which include the Gabes governorate. Another article reflects demands, heard increasingly since the revolution, to let resource-rich regions keep a heftier cut of the revenues they generate, which would be a departure from the centralized model the state has followed since independence. But Tunisia’s economic crisis, aggravated by many factors including a slowdown in the phosphate industry, puts sharp limits on the public money available to help the poorer regions catch up. When Hocine Jrad became the governor of the Gabes region in November 2012, a rash of disruptive protests had left the city “on the verge of paralysis,” he said. The protesters included groups of the unemployed demanding jobs and workers seeking more compensation or more security in their contracts. In April 2013, Jrad helped negotiate an end to the blockage of the commercial port by the men who fish in the Gulf of Gabes. They demanded compensation from the company for a drop in their haul that they attributed to pollution. In a filmed interview, one declared, “The GCT has done great harm to us, the fishermen of Gabes …. We demand that the government come up with a plan to get rid of land, sea, and air pollution. We want a clear road map." The GCT has pledged to take a list of steps to address concerns, most slated for completion this year or next. These include investment in equipment to reduce emissions of sulphur dioxide, nitrous oxides, gaseous ammonia, and malodorous gases, and to reduce the consumption of ground water. They also include improved monitoring of the factory’s emissions and waste. If most of those interviewed in Gabes say that, so far, the GCT has promised more than it has delivered, it is probably because the company’s most visible and contentious form of pollution - the streams of PG gushing into the gulf - continue unabated. The GCT has pledged to end its dumping in the sea and pump the PG slurry to a site inland, at a cost of 400 million dinars (US$240 million) – once agreement for stacking the PG near Oudhref, or another location, is reached. The land-based deposit is the solution that environmental groups have favoured since the GCT opened its first factory in Gabes in the early 1970s, when Habib Bourguiba was president. When the GCT opened its first factory in Gabes in 1972, dumping PG into waterways was the norm at fertilizer factories in Western Europe. However, Europe gradually switched to stacking it on land - and, to some extent, re-purposing the PG as a soil amendment and as a material for road-building and construction. By the late 1990s, dumping into waterways had stopped in Europe. In Gabes, a switch to inland dumping of PG has proven complicated. In the 1990s, experts found no available sites near the plant with the right geological and hydrological characteristics to isolate the waste safely. In 2004, they identified a more suitable site 20 kilometers to the northwest, near Oudhref, a city of about 10,000. However, at that time, the cost of transport, either by pipeline or train, was prohibitive. Eventually, technological breakthroughs brought down the price of pumping the waste and in 2012 GCT was ready to build a pipeline to Oudhref. On October 16, 2012, a large portion of Oudhref’s population turned out to demonstrate against the project. The project remains on hold. The EU has allocated grants and the European Investment Bank (EIB) has approved loans to help build the phosphogypsum pipeline if and when agreement is reached on siting it. Trabelsi admits that the problem is partly one of communication. “Before the revolution, we communicated only with the ministries,” Trabelsi said. GCT created its environmental affairs unit in Gabes in 2001. It added a public communications unit only in 2013. 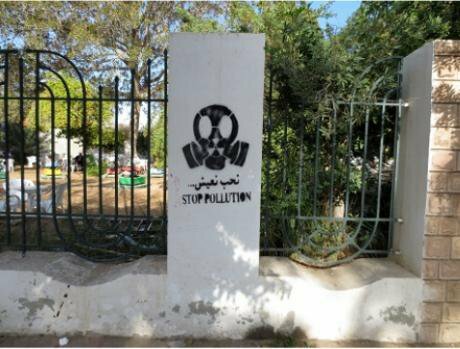 Last October, the Health Ministry organized a conference on air pollution and health, at which GCT representatives fielded heated questions from local activists, a scenario unthinkable under Ben Ali. Trabelsi said he hopes that, following national elections, now anticipated for late 2014, the next government will put in the effort needed to bring all the parties around to an agreement on storing the PG on land. Along with suppressing the right to protest pollution, the Ben Ali government discouraged scientists from conducting studies of the impact that pollution from state-owned industries had on public health. No rigorous studies were conducted in Gabes, said Dr. Yahya Hamdi, the Health Ministry’s director for the Gabes region. Without such data, policymakers and the public cannot assess the potential harms from the GCT plant, or determine the costs and benefits from various pollution-reduction measures. In Europe, Croatian scientists conducted a similar study in 1990-1991 found a correlation between acute respiratory incidents among children and variations in the level of pollutions associated with a nearby fertilizer plant. Dr. Hamdi said the government has agreed to fund the first rigorous study of pollution and health in Gabes this year. Studies intended to establish causal links between pollution and morbidity can take years to carry out. How can policymakers reconcile the lengthy timetable that such research tends to require and the public’s pent-up demand to curb pollution quickly? One middle path is to act on the basis of existing studies for comparable industries elsewhere, said Joe Amon, an epidemiologist who is health and human rights director at Human Rights Watch. In some cases, Amon said, the most clear-cut evidence of causality in industrial pollution cases can come from studying the workers at the plant, whose exposure is usually both higher and easier to measure than that of the nearby residents. Trabelsi said he was not aware of any studies of the health of GCT workers or any common medical complaints, but supports the idea of studying them. If the smoke and gases coming from the factory’s towering chimneys are less toxic than local residents have come to believe, they may still endanger certain groups disproportionately, such as the young, elderly, and asthmatics. Much of the health impact would depend on local conditions surrounding this dusty industry, such as weather patterns, the proportion of the more noxious, smaller particulates that the factory releases into the atmosphere, the pollution-control technologies it uses, and the concentration in the local phosphates of impurities such as cadmium, a toxic heavy metal associated with lung cancer and kidney damage. The answers to these questions remain unknown because of the state’s negligence in setting up rigorous monitoring. As for water pollution, Trabelsi contends that PG-dumping impacts only a narrow swathe near the plant, which could be dredged and decontaminated if the factory ceased its discharge into the sea. He pointed to other factors, such as overfishing, as the main culprits in the decline of marine life in the Gulf of Gabes. The study recommended a halt to the dumping in the sea of PG – “without which no other depollution programme makes any sense” - followed by a clean-up operation and careful monitoring of marine conditions. In addition to air and water pollution, there is concern about the vast quantity of fresh water that GCT uses in its production process. The region’s aquifers – the main source of fresh water given the paucity of precipitation – are overtaxed. Mabrouk Jabri, who heads a local association called Forms and Colors of Oases, contended that industrial consumption of ground water is the main threat to the city’s coastal oases, which tourists like to traverse in horse-drawn carriages. Jabri acknowledged that factors such as urbanization and the subdivision of farms, through inheritance, also take a toll. 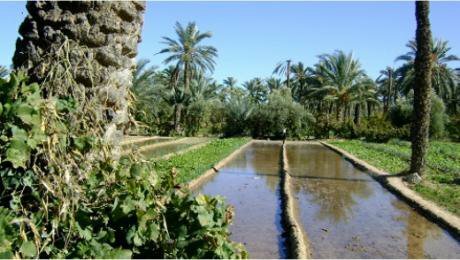 Irrigation canal in the coastal oasis of Chenini. Credit: Association Formes et couleurs oasiennes.Trabelsi contends that, the consumption of fresh water by GCT, often overstated by its critics, will decline as the company implements projects to increase the use of treated waste water and desalinated water. In addition to the pressure to clean up the environment, GTC faces pressure to create jobs. Tunisia’s southeastern and southwestern regions have an unemployment rate of about 25 percent, compared with a nationwide rate of 15.7 percent, according to official statistics. The GCT complex itself currently employs about 4,000 workers, making it the largest employer in Gabes outside the public administration. Some Gabes residents say that the company must make up for past discrimination that disadvantaged local job applicants. Trabelsi denied there was any discrimination, only a national recruitment process for skilled positions. Starting in 2011, job-demanding protesters have sporadically blocked roads and entrances to numerous state enterprises. Faced with actions of this nature around the country, the first interim governments following Ben Ali’s ouster favoured make-work programmes in the name of social stability, even though they cost the state and often involved no-show jobs. In Gabes, the GCT yielded to these pressures, creating in 2011 a “Company for the Environment, Cultivation, and Gardening.” This company has 2,400 people on its payroll, Trabelsi said, earning 400-500 dinars per month (US $240-300). Trabelsi said the burden of financing the Company for the Environment was less than continued disruptions to its production, which have already cut into sales and led to the payment of penalties to clients because of missed delivery dates. While he noted that the protests demanding more hires have eased since 2012, GCT’s make-work programme remains a flashpoint. On January 17, the police used tear gas to disperse hundreds of reportedly unruly job-seekers who had gathered before the governor’s headquarters in response to rumours that the Company for the Environment was about to put out an offer for new work contracts. The police arrested more than 10, but released them within 24 hours. The state enterprise that mines the phosphates, the CPG, bankrolls an even larger number of phantom workers. Its director told the National Constituent Assembly on December 20 that the company was paying 50 million dinars ($30 million) annually to 7,400 people who are not on the company ledgers and who, he said, would block the company’s mining and transport of phosphates if their payments stopped. Civil suits are another source of rising costs facing post-revolution GCT. During the Ben Ali years, the company settled a few small lawsuits for pollution-related damages. But since the revolution, Trabelsi said, the company has paid 2.5 million dinars (US $1.5 million) to settle such claims. He said that GCT believes other factors, such as helter-skelter construction on farmlands, are also culprits in degrading local agriculture. Trabelsi said GCT has not appealed court awards to growers, fearing that the response would be protests that could disrupt factory operations. But, he said, GCT’s in-house counsel has decided to begin contesting some of these judgments. Scientific studies may be relevant to these legal disputes: A 2012 study of a phosphate fertilizer factory in Syria found that the air pollution it released had significantly contaminated soil nearby, with implications for plants and groundwater. While Ben Ali tolerated no independent ecological activism or critical reporting on pollution, his government did recognize pollution as a problem, as shown by the mostly upbeat reports it published on clean-up and conservation measures it was carrying out, especially in areas with tourist industries. In 2004, the government closed the GCT fertilizer factory located near the center of Sfax, Tunisia’s second city, and carried out a major project to reclaim the area for development, with European assistance. In the 1990s, the GCT took steps to reduce emissions of sulphur dioxide and ammonium sulphate; some of the company’s equipment upgrades also had the effect of reducing emissions. The Ben Ali government also conducted some measurements of pollutants in the air and water, although the process was hardly thorough and the government did not publicize readings that exceeded the norms. In the 1990s, the GCT installed an air pollution measuring station in downtown Gabes, which functioned for a while before falling into disrepair. Its sign, which posted levels of three gases, still adorns the Boulevard of the Environment. Sign in downtown Gabes, now in disrepair, that once posted air pollution levels in real time. Credit: Eric Goldstein.The Ben Ali government even slapped the GCT with fines occasionally, Trabelsi recalled. “When we had a ship that leaked in the gulf, we might get cited,” he said. But authorities looked the other way as the company dumped millions of tons of PG year after year into the sea, even as it searched for an inland alternative. 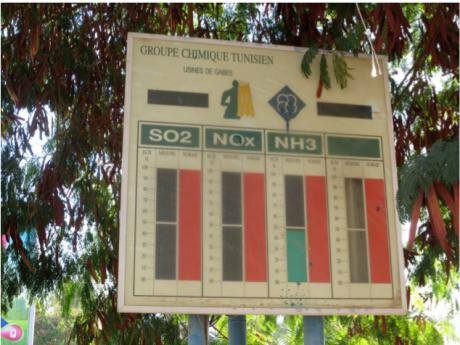 If the Tunisian government is more responsive now to public concerns about pollution than under the former regime, enforcement continues to be anaemic. “The ANPE [the environmental agency] still lacks the political standing to go after polluters as it should,” said Hamdi, the former minister of the environment. The website of the ANPE is revealing: it contains much on Tunisia’s international environmental treaty obligations and cooperation agreements, but little on the actual pollution levels around the country, or on the sanctions imposed on polluters. GCT issued a glossy colour brochure in 2012 titled, “Reconciling GCT with its environment.” Its cover shows lush green fields filled with poppies extending to the horizon. 2012 Brochure “Reconciling GCT with its Environment”GCT may say it's going green, but it also must contend with costly demands to create jobs, a citizenry newly capable of blocking projects they dislike, a free flow of information about pollution and its risks to health, soil, and water, and the prospect that the government that emerges from Tunisia’s first regular democratic elections may actually enforce environmental regulations. The toughest reconciliation GCT faces may be the one that it has to make with its changed political environment. The author wishes to thank Gabes-based journalist Moez Jamai for his research assistance.